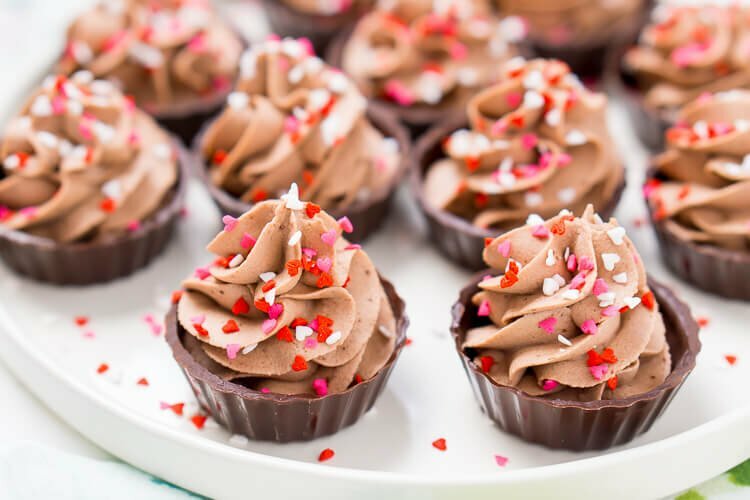 These 4-Ingredient Chocolate Mousse Cups are about as easy as it gets! They’re ready in 10 minutes and there’s no baking required which makes them a perfect last minute dessert! Okay, I know I said my 5-Ingredient Red Velvet Cupcakes were SUPER easy, and they are, they might just be the easiest cupcakes ever. 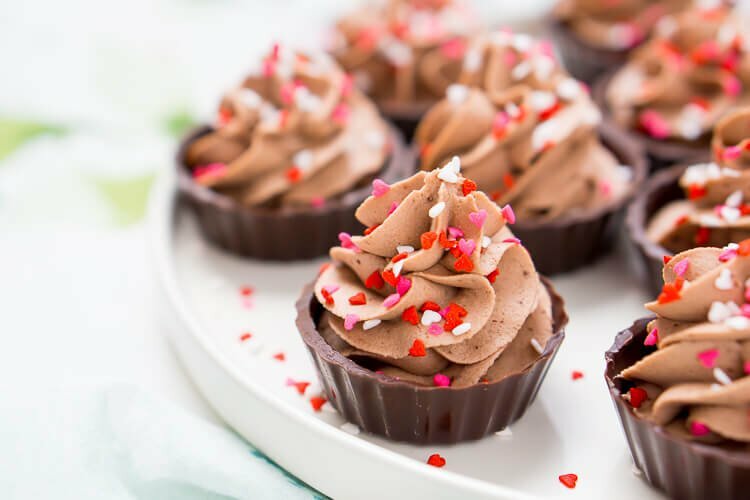 But these 4-Ingredient Chocolate Mousse Cups are an even EASIER dessert, I know, you didn’t think that was even possible! But with Valentine’s Day just a few days away, quick desserts are essential. You don’t want to spend all day slaving away in the kitchen, you want to spend it with your love. After all, time is precious. My husband and I’s OUR time is the most important to me. In a marriage, it’s important to be a little independent while still being one, as long as you keep your priorities straight. Speaking of time, I get asked on a weekly basis why I blog when I already have a full-time job because the blog takes up so much time. The truth is, I LOVE blogging and I NEED a creative outlet. If I wasn’t blogging, I’d be filling that time with something else. It’s probably better that I blog than watch another season of some B-rate TV show. Although I could really go for some binge watching right now, I’ll wait until House of Cards pops up on Netflix next week. The biggest thing is that Matt supports me in this venture and it’s his work behind the scenes that makes Sugar & Soul possible. And by behind the scenes, I mean cleaning up the mess that is me and my blog. I felt drawn to blogging for years before I started doing it and it’s something I’m really truly passionate about. It’s a dream and a reality at the same time. Through blogging I’ve made some amazing friends, I’ve unlocked skills and talents I never knew I had, and most importantly, it makes me HAPPY! As stressful and time-consuming as this blog might be, it rewards me a thousand times over. Kinda, like a marriage in itself, you married folks can understand that, right? So while I’ve got a full week lined up with Date Night in mind for Valentine’s Day, I’m curious what you do for YOU. What makes you happy and what makes you LOVE YOURSELF? 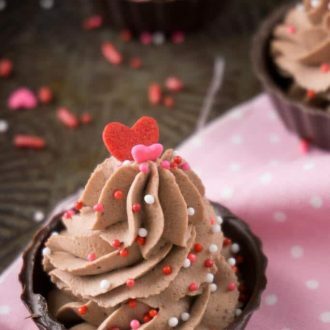 While you ponder, let’s talk a little about these 4-Ingredient Chocolate Mousse Cups, shall we? 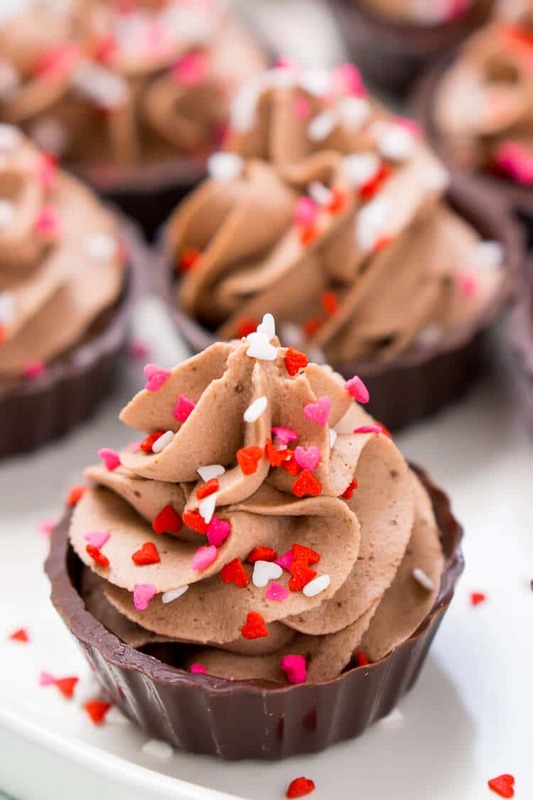 First off, they’re super easy, just some heavy cream, pudding mix, and confectioners’ sugar whipped up and piped into these Belgian chocolate cups. They’re ready in less than 10 minutes making them perfect for a last minute fix and since they’re small you can eat five and not feel bad about it! Plus they look like you spent way more time than you did and it’s perfectly okay to pretend like you did for some bonus points. Happy Valentine’s Day to you, right!? You can also just make the chocolate mousse and serve it in small bowls for dessert, no chocolate cups needed! You might also enjoy my Strawberry Mousse Cups! 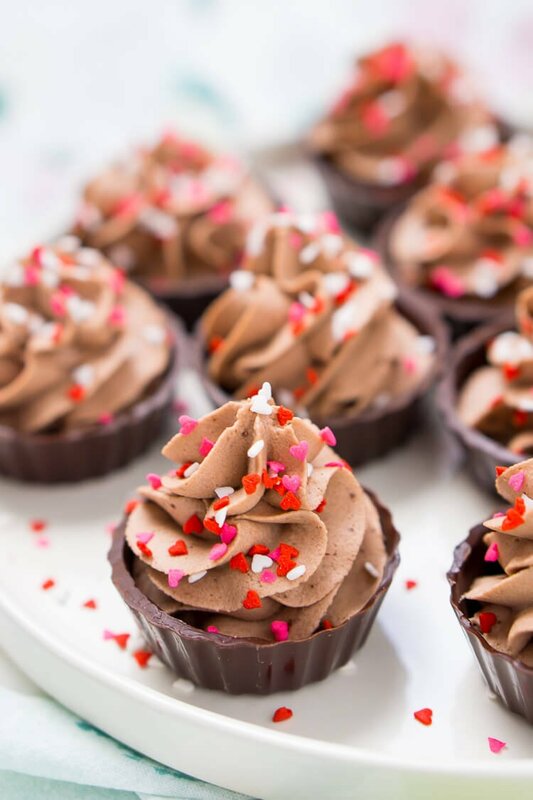 Watch How to Make these Chocolate Mousse Cups in the Video Below! 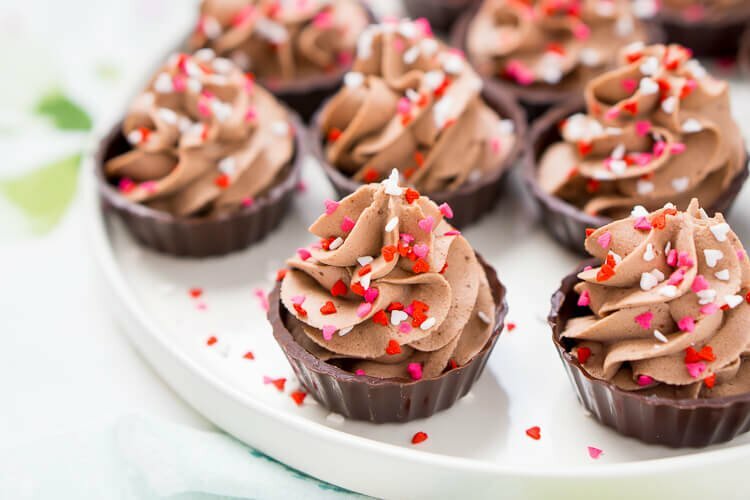 These 4-Ingredient Chocolate Mousse Cups are about as easy as it gets! They're ready in 10 minutes and there's no baking required making them a perfect last minute dessert! In a stand mixer, combine heavy cream, confectioners' sugar, and pudding mix and beat until light and fluffy, about 2-3 minutes. Pipe into chocolate cups and top with sprinkles. 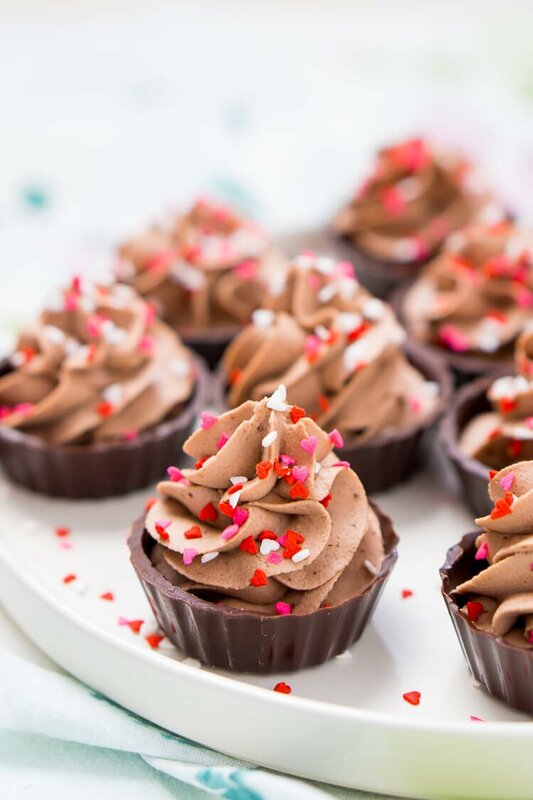 Pin these Chocolate Mousse Cups for Later! 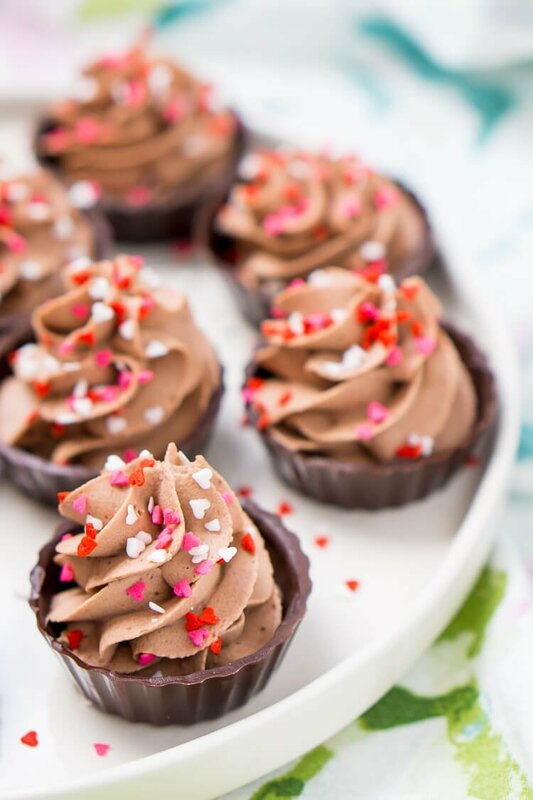 It’s crazy how super simple yet delicious these chocolate mousse cups are. Just wonderful & perfect for Valentine’s Day! This sounds amazing! I love mousse and only 4 ingredients? Cant wait to try it! They’re so pretty and look sooooo good! Question, would these need to be refrigerated after making. I was thinking of surprising my niece and her college friends (living in a dorm) with this but not sure if this could be left out in room temperature and for how long? These are definitely best when served right after making, but should be fine for about a day in the fridge or at room temperature. Are you using regular size or mini chocolate cups? Hi Barbara, I usually use the store-bought ones that are about the size of a mini cupcake pan. You can do the homemade ones as either mini or regular. Hi Amy, in the video I made double the recipe so it had twice the amount of ingredients making it 1/4 cup of pudding mix. Such beautiful sweet mini treats! How easy is this?! I just love them!!! Could I mix these with some whipped cream cheese to make them taste like cheesecake?! I would say once soft peaks start to form in the chocolate mousse, mix in the cream cheese. Use the ratios in the recipe I link to here in the comments.